I really appreciate simple, tasty food. I like this dish because it can be ready in under 10 minutes. Two medium size zucchinis (washed well), sliced thin. Using a medium, nonstick skillet, add 2 tablespoons butter. Melt and brown. 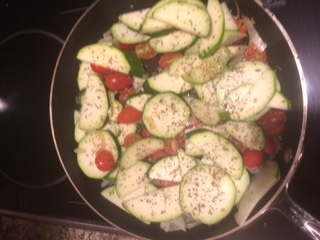 Carefully add zucks, fresh tomato, diced onion, and sprinkle with dried, Italian Seasoning and salt lightly. Stir and brown. You’ll have to watch closely, as they crisp-up quickly. Recipe takes about 6 minutes to make. Eating well, helps you heal well.